Amazon today opened up its checkout-free grocery store "Amazon Go" to the Seattle public, continuing a plan that the company says has the potential to "dramatically alter brick-and-mortar retail" (via Reuters). The new grocery store experience begins when customers walk through a turnstile and scan the Amazon Go app on their iOS [Direct Link] or Android device, which notifies the system that the customer is now in the store and shopping. Then, when they pick up an item and add it to their basket, cameras in the store and weight sensors on shelves associate each product to the customer who picked it up, and adds it to a virtual shopping list. This tallies all of the items picked up by any one customer (and items returned to shelves are deducted from the total), so when they're done shopping all that needs to be done is to walk back out of the store through the turnstile. Amazon Go then charges the credit card users previously synced to the app and sends a receipt to the app's inbox, replacing the need to stand in a traditional checkout line. The official public opening comes over one year after Amazon began testing the store with employees in December 2016, a time in which the company learned how to fine tune the experience, according to people familiar with the tests. The camera system became better at identifying people with similar body types, and learned from the "havoc" caused by kids in the store who moved items to incorrect places on the weight-sensing shelves. The Seattle location is located within Amazon's office building in the city, and right now the company isn't confirming when it will expand Amazon Go to more cities. However, it did state that there are "no plans" to introduce the technology into Whole Foods, which it acquired in 2017. For anyone in the city, you can visit Amazon Go Monday through Friday between 7 a.m. and 9 p.m., with food items ranging from dairy to ready-made Amazon Meal Kits and locally made chocolates. I'm not so sure how well this will work. As someone who worked in retail, customers would often pick up items and put them back in the wrong place. I wonder if the technology will be able to pick up on that. I hate when I see that. And there is a special place in hell for people that leave frozen food items on a shelf for canned soup. That said, I also think there could be issues with this system. I remember staying at a nice hotel on vacation. My 9 year old daughter was bored and thought it would be nice to make sure all the items in the mini bar were all facing forward. By lifting each one the hotel's billing system was triggered and automatically charged my room for a purchase--of everything in the mini bar. There was no "I put it back" functionality. Thankfully they refunded the huge charge I saw on my bill when checking out. Something I want to know - does it recognize when I put litter on the shelf? How does it respond to that? Hopefully by banning you from the store. I don’t see why they’re doing this. For years all we heard about was how brick and mortar stores were at a huge disadvantage to internet-based stores. Is this a hedge against shipping costs?? It’s a grocery store. The items for sale are food or convenience items that are impractical to deliver. I prefer my local grocery store here in the midwest, which is called Hy-Vee. We order our groceries from their site and the next day they arrive during the scheduled window. Someone brings them right to our door. As long as you spend at least $100, delivery is free. Otherwise it's $5. If they end up being out of an item in-store, they will often upgrade you to a nicer item (name brand or larger size) for free. When we first started doing it, the clerks that were collecting groceries were picking out fruits and veggies that were sometimes of lower quality that looked pretty bad. They've gotten a lot better over time, and the few times where we lodged a complaint we were sent an apology letter from the store manager and a $10 gift card. They seem like they really want to get it right and they've been getting better over time. They've even been listening to user feedback and the site is becoming easier to use. I like that our local company is seeing the threat from Amazon and being proactive about it. And that's coming from someone who loves to use Amazon. Competition is always good. And there is a special place in hell for people that leave frozen food items on a shelf for canned soup. I can see the exhibit going up in The Bad Place museum right now. Nothing is impractical to deliver. Instacart in Toronto will let you shop anything from Loblaws on your phone then get it delivered. Even fresh meat. Go backs will require staff in addition to delicned credit cards. 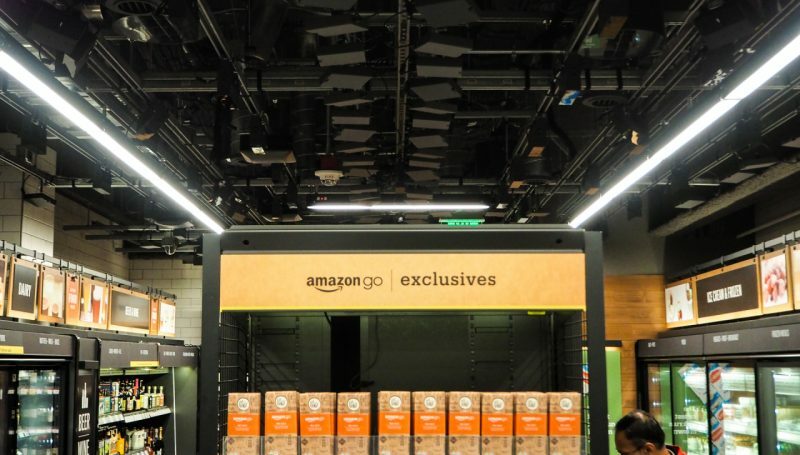 Amazon today opened up its checkout-free grocery store "Amazon Go ('https://www.amazon.com/b?node=16008589011')" to the Seattle public, continuing a plan that the company says has the potential to "dramatically alter brick-and-mortar retail" (via Reuters ('https://www.reuters.com/article/us-amazon-com-store/amazons-automated-grocery-store-of-the-future-opens-monday-idUSKBN1FA0RL')). The new grocery store experience begins when customers walk through a turnstile and scan the Amazon Go app ('http://appshopper.com/shopping/amazon-go') on their iOS [Direct Link ('https://itunes.apple.com/us/app/amazon-go/id1183036929')] or Android device, which notifies the system that the customer is now in the store and shopping. Then, when they pick up an item and add it to their basket, cameras in the store and weight sensors on shelves associate each product to the customer who picked it up, and adds it to a virtual shopping list. The official public opening comes over one year after Amazon began testing the store ('https://www.macrumors.com/2016/12/05/amazon-go/') with employees in December 2016, a time in which the company learned how to fine tune the experience, according to people familiar with the tests. The camera system became better at identifying people with similar body types, and learned from the "havoc" caused by kids in the store who moved items to incorrect places on the weight-sensing shelves. Why all the fancy cameras and scales. Couldn't this just be done with RFID instead?